Seraphin De Nicola, baptized Felix, was born in Montegranaro, Italy, in 1540. His father and brother were masons but Felix was not strong or skilled, so he was sent to work as a shepherd, a job he enjoyed because it allowed him to be by himself and pray. When his father died, his older brother needed Felix to help with the business. He was given tasks he could not complete and his ill-tempered brother would beat him and belittle him. A friend urged him to accept his more spiritual side and suggested he speak with the Capuchins. He joined the Capuchins as a lay brother when he was eighteen. He served in various friaries as porter and quaestor. 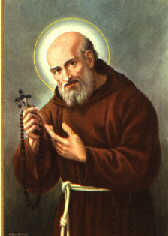 His life was noted for its unaffected simplicity, close union with Christ, and great love for the poor and for sinners. He died at Ascoli in 1604. He was canonized by Pope Clement XIII on June 16, 1767. God, our Father, You endowed Saint Seraphin with the manifold gifts of the Spirit, and made him an admirable witness of the riches of Christ. Through his intercession make us grow in knowledge of You that we may walk faithfully before You according to the truth of the gospel. We ask this through our Lord Jesus Christ, Your Son, who lives and reigns with You and the Holy Spirit, one God, for ever and ever.